Diwali and jewellery have always been synonymous with each other. The dazzling outfits which are hand-picked especially for the auspicious occasion of Diwali and the sparkling fireworks that go on till late night come together with the muted aura of scintillating Diwali jewels. This Diwali, make sure you shimmer and shine with our array of eye-catching pendants, crafted to perfection, to make you the showstopper of the night. 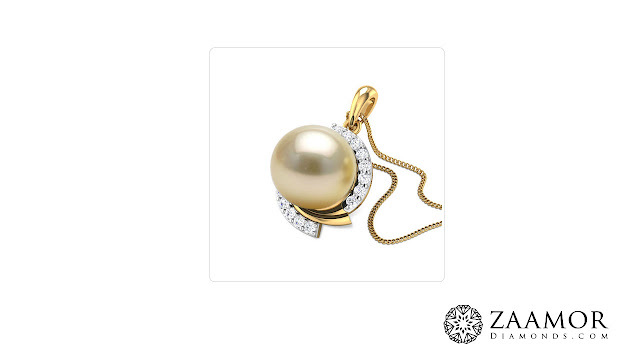 The Vrishni Pearl Pendant adds the perfect amount of glamour to your Diwali outfit. The dainty pearl, strategically placed on an intrinsic grid of diamond-studded yellow gold, will instantly uplift your neckline with oodles of grace and elegance. You can opt for yellow or white gold with a purity of 14 Kt or 18 Kt. This pendant works best on a dainty salwarkameez with a modest neckline. With such a majestic name, you can only imagine how the Panchita Diamond Pendant will uplift your Diwali outfit. The classic rounded design with a sway of sparkling diamonds flowing right through the centre is a conversation starter on its own. 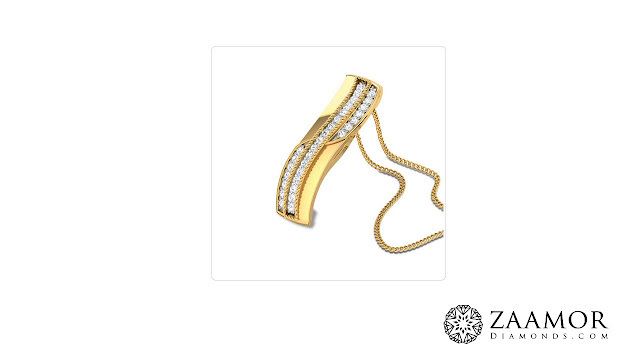 Choose between white and yellow gold to make this a customised masterpiece. The contemporary design works best with indo-chic outfits. Make your friends go green with envy by showing off the spectacular Delilah Diamond Pendant resting in between your delicate collar bones. The striking green will complement any outfit, be it a flowylehenga or a classic salwarkameez. Treat yourself to the exquisite design of diamonds embedded in gorgeous yellow gold. There is something quintessential about wearing an unconventional design around your neck, and the chic Petronella Diamond Pendant makes you feel exactly that! The eye-catchy design, lined with an array of sparkling diamonds, makes it a must-have in every fashion-conscious diva’s jewellery box. 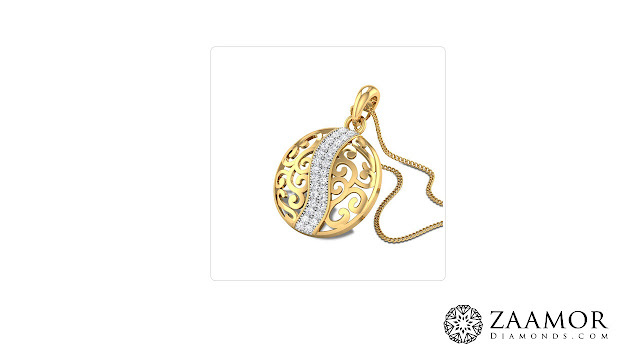 This breathtaking pendant is also available in white gold to match your outfit on the dot. Bring out the fashionista in you by pairing this stellar piece with a collared kurti and leggings. 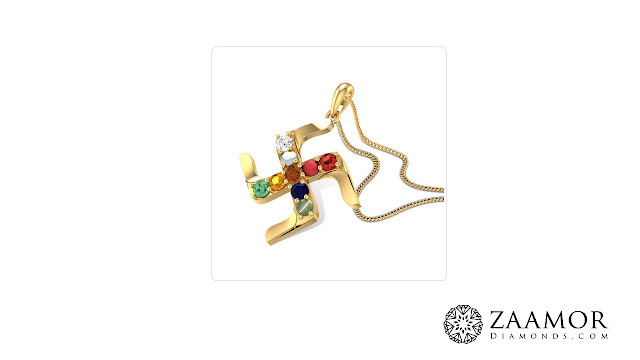 The SwatstikNavratna Pendant is perfect for Diwali due to the vibrant-coloured gems it comes embedded with. Additionally, the pendant is loaded with the benefits of wearing Navratnajewellery and is guaranteed to keep you away from evil eyes. What more? 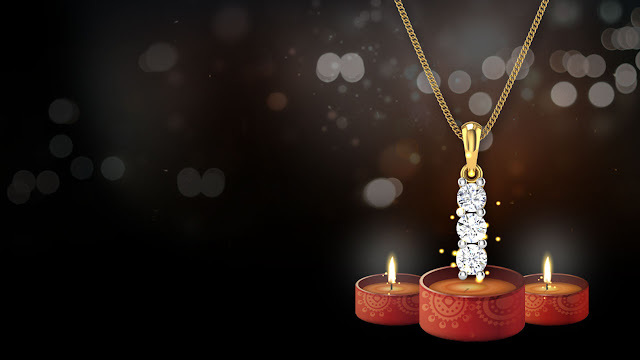 You can choose from a purity of 14 Kt or 18 Kt to make it fit your Diwali budget! Shine like a superstar by wearing this pendant with a vibrant and colourful saree. What is Diwali without some much-needed devotion? 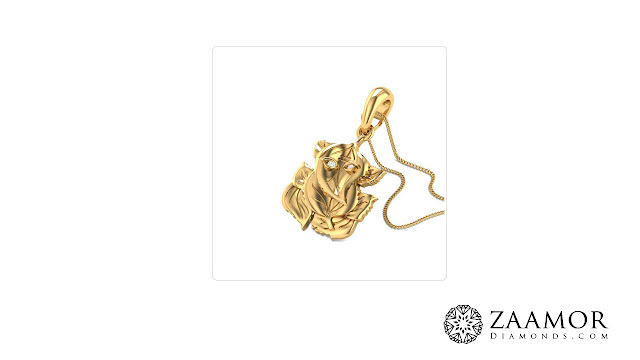 Show your love for Ganesha with the remarkable Gatatrasa Diamond Pendant. 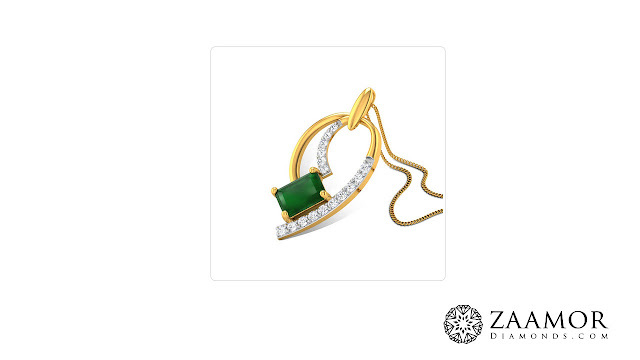 This traditional yet contemporary piece can be customised in yellow and white gold with a purity of 18 Kt and 14 Kt. The well-placed leaf design is guaranteed to keep all eyes on you as you dwell in devotion to Lord Ganesha. This conventional piece works best with a traditional half-saree. 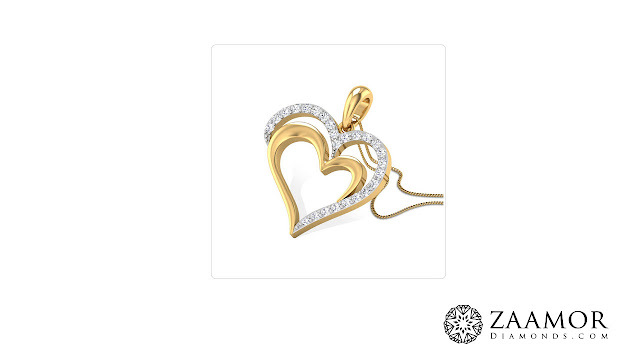 Hearts never go out of fashion, and the gorgeous Elise Diamond Pendant is all about keeping it classy. The smitten design of two hearts colliding as one, with a dash of brilliant diamonds creating a striking contrast on the yellow gold is sure to take anyone’s breath away. Furthermore, the modern design works well with both Indian as well as western outfits. This Diwali season, why keep the floral trend constrained to your clothes alone? 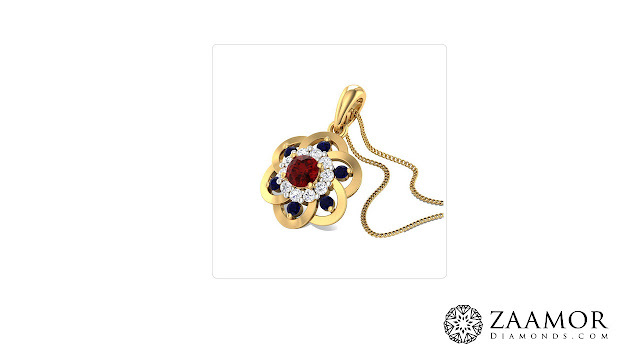 Take your fashion game up a notch by opting for the beautiful Nereus Floral Sapphire Pendant. The striking collaboration of sparkling diamonds and majestic sapphire, brought together in a floral grid of spectacular yellow or white gold, is guaranteed to make you look and feel like a real princess. Pair this gorgeous pendant with a beautiful anarkali and keep the compliments coming! So what are you waiting for? This Diwali, bring out the diva in you with a spectacular pendant complementing your dazzling outfit. Log on to Zaamor Diamonds today and choose from our extensive range of pendants, perfect for every Diwali look! How to spend and save this Diwali!